The political closeness of suburban areas in the nation has lead some to question whether Republicans can hold on to their majorities in this year's mid-term election, especially in the U.S. House. But while some believe that North Carolina has been trending more like the nation in recent elections, the regional differences are rather distinct to the Old North State than the United States. 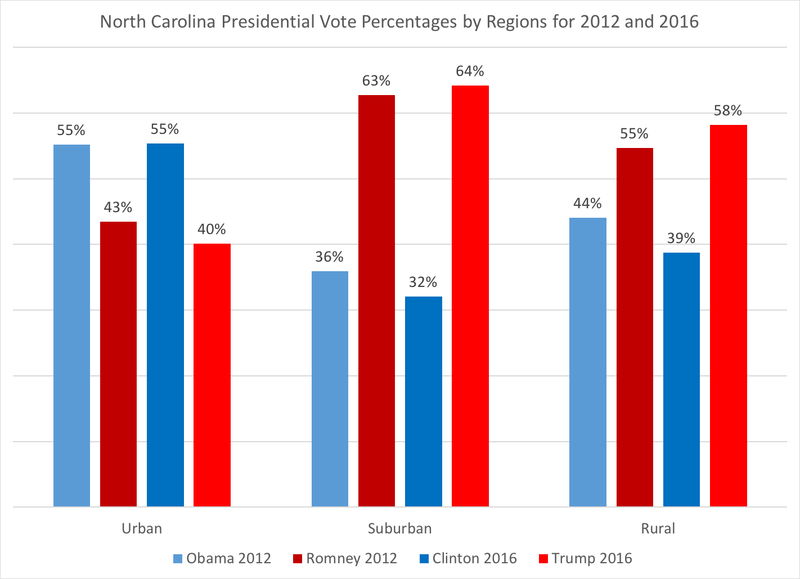 As noted from 2012 to 2016's presidential elections, the "gulf" between how each of the three areas voted widened: from a 12 to 15 point difference and Democratic advantage in urban counties, to a 32 point difference and Republican advantage in suburban counties and a 19 point Republican advantage in rural counties. Thus, North Carolina's counties are seeing a distinct divide, but it's more a Democratic urban versus Republican combined suburban and rural counties. 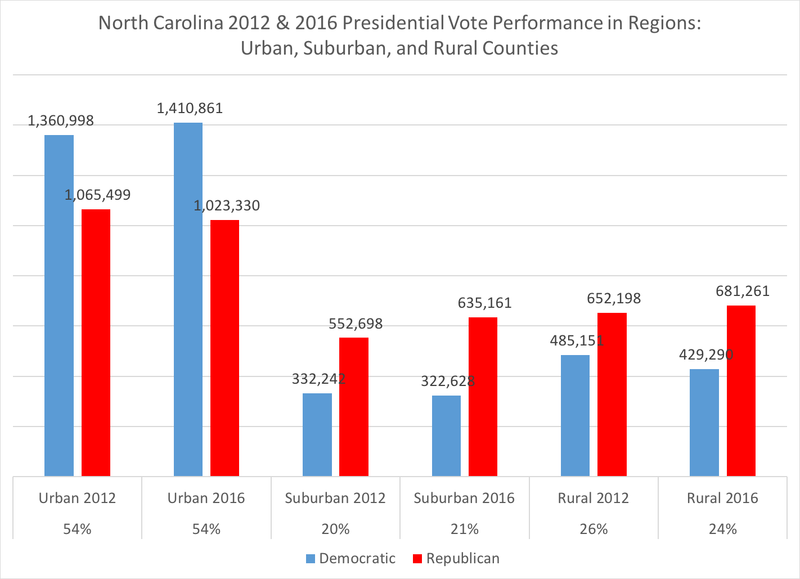 But looking at urban counties doesn't quite capture a full picture of urban political behavior, since most of North Carolina's major urban cities, such as Charlotte, Raleigh, Greensboro, and Asheville, among many, don't necessarily "fill" their respective counties completely. 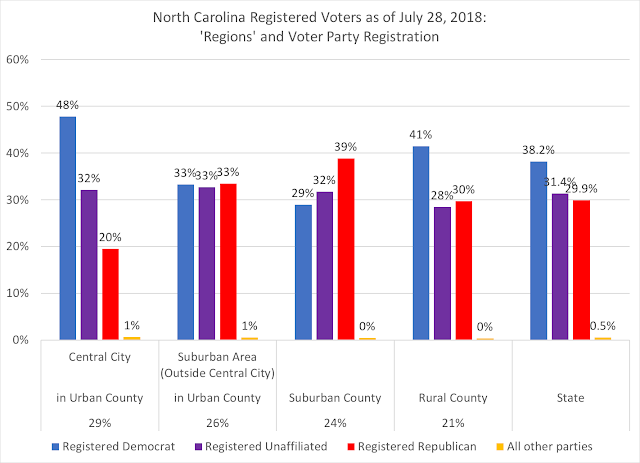 For example, while Democratic Charlotte does dominate Mecklenburg County, the suburban north and south of the county holds distinctly different (for the time being) are more likely to be Republican areas, or trending more competitive in recent elections. See this post to view maps that illustrate what the city of Charlotte and its surrounding suburban areas in Mecklenburg County are experiencing. If this year's elections will hinge on the suburbs, having a better sense of voters who are in urban county areas but outside the central city will be necessary to understand the complete picture of what candidates may be facing this fall. While urban counties hold 54 percent of the 6.9 million registered voters in the state, the central city holds slightly under 30 percent of the state's total, with over a quarter of voters in the suburban areas outside the central city but still within the urban county. However, there is a stark difference between the central city party affiliations (registered Democrats at nearly half of the central city voters) while suburban voters in the same urban county are evenly divided into thirds. 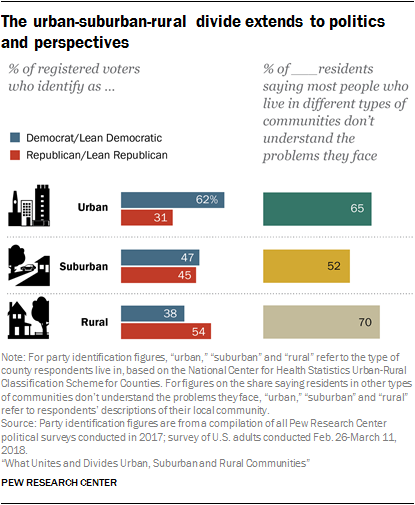 When you move into the surrounding suburban counties is when you find the Republican advantage of those areas, with nearly 40 percent of registered voters as Republican. 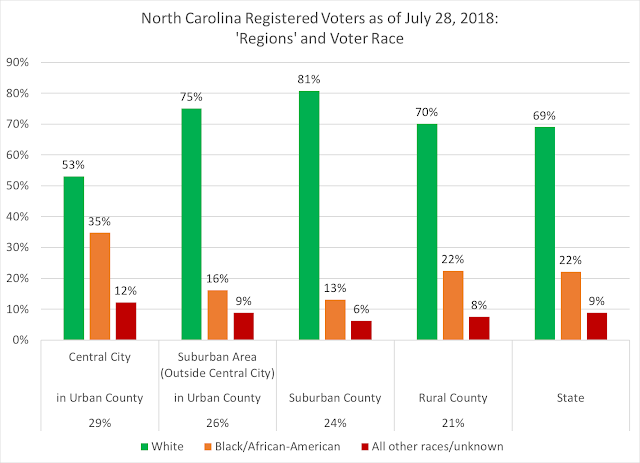 Not surprising, urban "central cities" have the greatest racial diversity among the categories, while surrounding suburban counties have the least diverse voter pool. 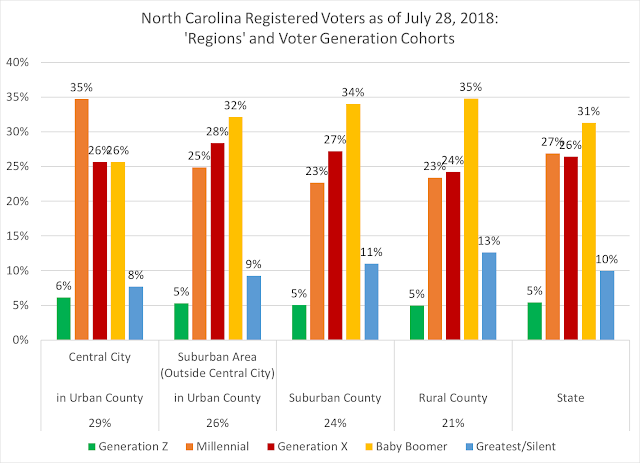 Over 40 percent of central city voters are under the age of 37 (Millennials and Generation Z cohorts), while Baby Boomers make up the largest plurality in other areas; in suburban areas outside of the central city but in an urban county, however, Baby Boomers will be competing very soon with Millennials and Gen Z for plurality status among registered voters. 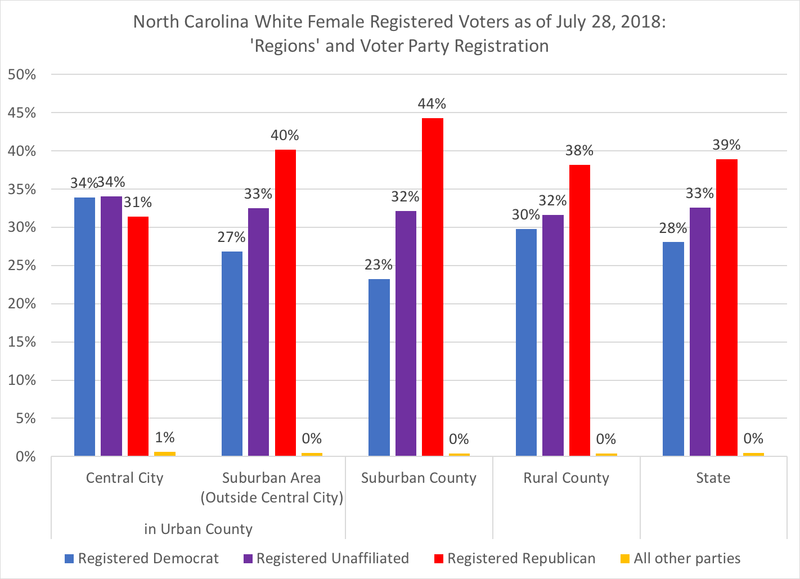 Especially noteworthy in this election cycle has been the focus on suburban women, especially white women, who may determine the outcomes of several contests, especially in the U.S. House, in this year's mid-term elections. While white females are generally more Republican in registration in their state numbers, central city white females are evenly Democratic or unaffiliated at 34 percent each, with 31 percent being registered Republicans. 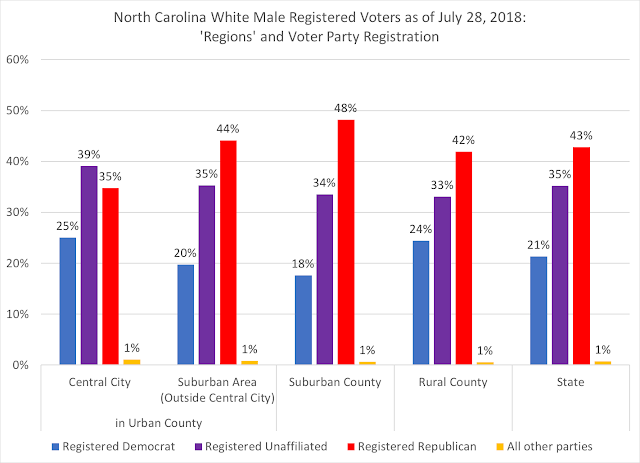 But in the other areas, registered Republicans are the plurality, with 44 percent of suburban county white females registered as Republicans. 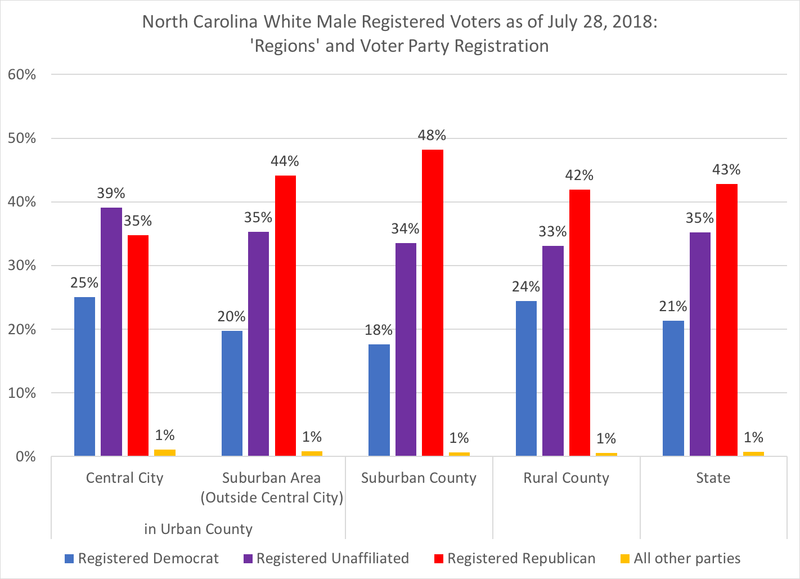 In watching the 2018 elections in North Carolina, with its blue moon cycle and the focus on U.S. House races, the dynamic of seeing how central city and suburban voters, both inside urban counties and in surrounding counties, will react and cast their ballots may give some sense of how things will develop for the November contest. Just a reminder: voting in North Carolina begins in only 32 days from this posting, with absentee voting (by mail) beginning on September 7.